Have you ever wanted to make your own game or animation? 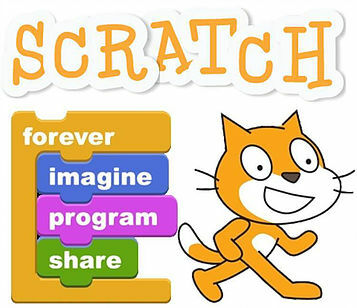 Now with the power of MIT’s Scratch programming language, you can! MakerState invites you to try out Scratch by remixing an animated dance party. During this Design Challenge, you will use programming blocks to move sprites (Cassie and the dinosaur) on a dance floor and create a routine. Sprites are even able to talk to or think about each other as they dance. Instructions for completing and submitting the Design Challenge are below. The Challenge takes about an hour and should be done with a parent/guardian’s permission and assistance. You will need an internet-connected PC or Mac. Winners of the Design Challenge are chosen by a panel of judges on a rolling basis. Winners are assigned Camp Cadet status at STEM Camp during any week they attend STEM Summer Camp and will receive a free camp t-shirt, glow-in-the-dark bracelet, and a $75 discount to STEM Summer Camp. For students seeking partial or full scholarship to STEM Summer Camp through Schools That Can or Student Union, scholarship award notifications will be emailed by June 30. Design Challenge: Remix a Scratch program to turn a simple dance animation into an impressive dance routine. Be sure to get permission from your parent/guardian to do this Design Challenge project. Your parent will help you share your submission with MakerState when complete. 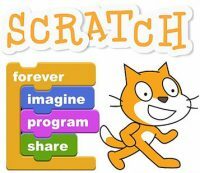 Check out this Getting Started with Scratch introduction video. Create an account at https://scratch.mit.edu/ if you are new to Scratch and stay logged in. Navigate to MakerState’s version of the Dance Party Program here. Click on the green flag to view how the dance party animation works. Click “see inside” button. Now you are in the programming area, click remix (upper-right corner). View this Youtube video on how to move a sprite here. Remix the program by changing how Cassie and the Dinosaur dance. Include one or more additional sprites too. Consider using several of the blocks pictured below in your remix. Each of these blocks are from the blue “Motion” or purple “Looks” blocks under the script tab. Get creative! Check out the numbers at the bottom-right corner of the animation to plan your sprite / character’s dance moves. Optional: Change the music and/or background. To change the music, click on the “Stage 6 backdrops” background icon in the lower-left corner. Use the drop down to change the “Girl Like You” to “record” on the purple play sound block. Select the icons to choose music from the Scratch library or upload your own sound file. When you have completed the remix, click on “project page” in the upper-right hand corner. Write a message on the project page to tell us about your new and improved dance party, and your experience with coding. With your parent, click share, and copy the URL of your animation and send it to info@maker-state.com. Tell us your name, your grade, and which school you go to. You can also share your project publically on MakerState’s Scratch Studio. Follow the link and click on the grey ‘Add projects’ button under the Projects tab. Leave a comment too under the Comments tab and tell us what you learned while creating your animated dance party.